Sarah Jenema has a long and successful background working with people for customized results. A compassionate listener and quick service provider, Sarah will work diligently to gain the trust of clients and achieve their unique, desired outcome. Sarah aims to build lasting relationships with clients, and her strong people skills, built from a history in the education and service industries, ensure you are in great hands! Sarah considers no job too small, and whether renting, buying, or selling, Sarah will help you find your place in the world. Sarah attended the University of South Carolina and made the move to Chicago in 2007. After over ten years and multiple homes in Chicago, Sarah knows the most popular neighborhoods in the city well. 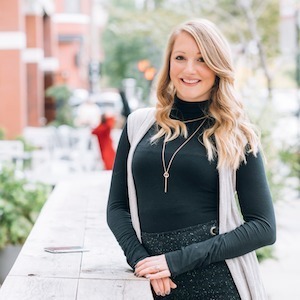 She loves to share her knowledge of all the amazing foodie hotspots Chicago has to offer. Sarah lives in West Town with her husband and two dogs, Jasper and Parker. She enjoys live music around the city and all things Chicago sports. She would love to talk to you about finding your perfect home!